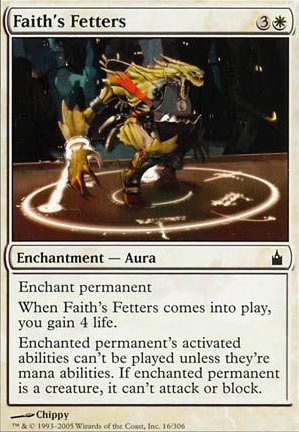 Enchant permanentWhen Faith’s Fetters comes into play, you gain 4 life.Enchanted permanent’s activated abilities can’t be played unless they’re mana abilities. If enchanted permanent is a creature, it can’t attack or block. 135 decks jouent cette carte.